While your preparing the holiday dinner have the kids make a Paper Turkey Dinner of their own! With only a few simple craft materials you can make this fun craft for the holidays! 1. Crumple up some scrap paper and fill one of your brown bags about two-thirds full. Fold over the top and tape or glue to secure (this will be the main body of your turkey). 2. Crumple a piece of scrap paper, long-ways, not so it's a ball, but long like a turkey leg. 3. Put the crumpled paper into one side of another brown paper bag and wrap the bag around the crumpled paper, tape to secure. Wrap a piece of twine or scotch tape around the end and trim off any excess bag. Repeat steps 2 and 3 to make the second turkey leg. 4. Glue your turkey legs to either side of your turkey body, then place on a paper plate. 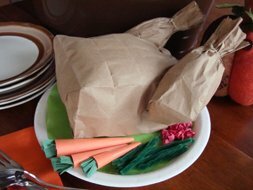 We used a little bit of green tissue paper on top of our paper plate just to look like lettuce garnish; you could also glue your turkey onto the plate if you wish. 5. Now you need to make some vegetables for around your turkey. We made green beans by wrapping two pieces of green pipe cleaner together. We made cranberries by crumpling up small pieces of red construction paper. We made carrots by making a cone shape from orange construction paper and gluing in a small piece of scissor-shredded green paper. Be creative and make some really yummy vegetables for your paper turkey dinner, and enjoy!